The Scots King Alexander III routed the army of the Viking King Haakon IV at the Battle of Largs in 1263 A. D. Legend has it that the Vikings were intent on surprising the Scottish army under cover of darkness. Advancing barefoot, one of them trod on a Thistle. His cry of pain alerted the Scots, who fell upon the invaders, driving them back into their longships. 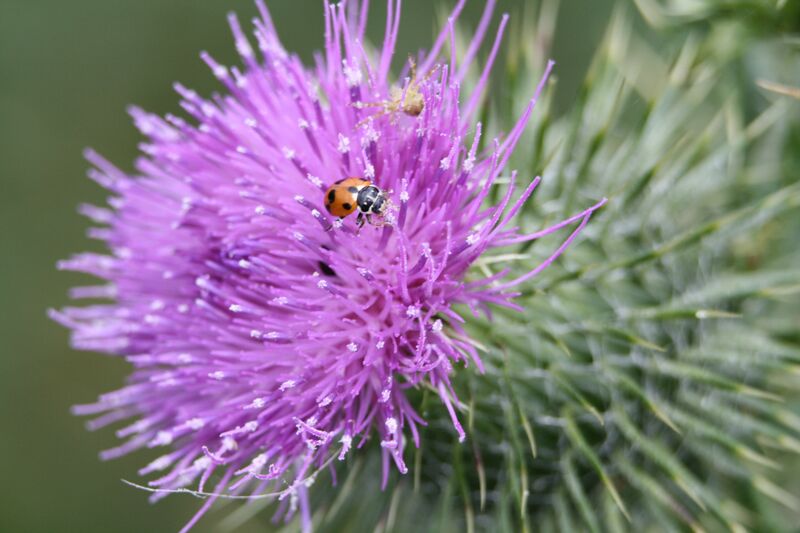 From that day the Thistle was adopted as the Emblem of Scotland. That’s what our new potholder says, anyway. 😀 And it came from Scotland! Where freedom expires amid softness and sighs. Land of the brave and proud, land of the free. And proudly she sings, looking over the sea. Of England, of Denmark, of Rome and the world. Triumphantly riding through ruin and death. Victorious in battlefield, Scotland the brave. See you later, and don’t step on any of THESE….